The Rise of Modern Astrology. Then, around 150-180 years ago, astrology in Western society slowly began rising up once more into public favour, imagination, and consciousness. At the beginning of the 20th century, a final grand revival of astrology came about owing much to the efforts of the charismatic, enigmatic, and controversial astrologers, Sepharial (1864 - 1929) and Alan Leo (1860-1917), who became the founding fathers of the Astrological Lodge of the Theosophical Society in Great Britain. Since Sepharial and Leo's time, Western culture's fascination with astrology has continued on with us and grown and evolved through the years. Millions of people throughout the world show a fascination with astrology, once the realm of Kings and Queens only, astrology is to be found in every newspaper, funfair and circus, as well as on the Internet. Millions of dollars exchange hands in pursuit of the divination of the future, which is to do with the inherent weakness of most people to look outside themselves for help and guidance. This divination affects human lives and can even change the course of History. It is of more interest in our modern culture than our religions are and millions of people run their lives by it. Ronald Reagan was reputed to consult astrologers, as was Margaret Thatcher in Britain in the 1980's. It is well known that Hitler consulted astrologers and we all know where that led. Astrology is very dangerous in the wrong hands and can cause a person who foolishly relies on it to shape their lives under the influence of false information that may be unwittingly supplied. Worse, should a leader of a country take advice by consulting astrologers, then the results could be disastrous for millions of people. On balance however, during my research, I have found astrologers generally to be, well-meaning, spiritually aware and kindly souls who believe that they are providing a valuable service in the world. Never the less, the findings that I have made during my research on the origins of the Celtic cross and its association with ancient astronomy must be made light of in the public eye. What is the definition of Astrology? A pseudoscience based on the notion that the positions of the moon, sun and stars affect human affairs and that one can foretell the future by studying the stars, etc. It is the study of the signs of the zodiac, related to your birth date and the associated planets, the sun and the moon. Why? The idea is ancient and based in the concept that we are all affected by the position of the sun on the day we were born, this concept is derived because we are Electro-magnetic energy created by the sun. In other words we are star or sun stuff. The Pharaoh Akhenaten held such a view when he over threw the established house of Amen or Amun to establish a new city and religion on the banks of the Nile at Akhet-Aten. According to the ancients and some modern indigenous races, the sun is the father and the earth is the mother. The father seeds the mother by sending the soul into the material form, the body, which is created from the dust of the earth. In other words, the moment we are born our soul is considered to enter our body directly from the sun. It would seem that they were right in a sense as modern Science is finding out in the Electric Universe theory. The seven planets that surround the sun were known as the gods and affected the personality of the souls that leave the sun on their journey to earth to become incarnate in a material form. If you were born on a day when there are planets in and around your solar birth sign, then you would become under the influence of these planets which would affect your personality and your destiny. The ascending sign exerts further influence on your destiny with its own personality traits. The ascending sign is the one that breaks the eastern horizon at the time that you take your first breath of life. 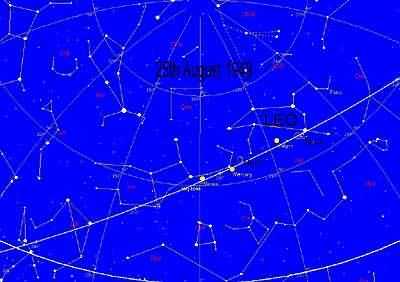 Astrologers usually look for the zodiac sign that is seen on the eastern horizon at 09.00 hours. Let me first show you the definition of birth charts from a top astrologer so that there may be no misunderstanding of the revelation that is about to follow. "You may be at the stage of asking, "What is a horoscope?" If so, you're going to find the answers here. To begin, the horoscope is a map that appears as a two dimensional chart. It shows the position of the Sun, the Moon, and planets at the precise moment of your birth. The planets are frozen in their position at that initial moment of birth. That is why this type of horoscope is known as the birth chart or the natal chart. A correct interpretation of these birth positions exposes much about you. It can be thought of as the "hand" that has been "dealt" in life." From Astrology by Michael McClain 4. I would propose that the Greek philosophers had it right and the reason for this was that they constructed their own instruments with which to carry out the necessary measurements. They also had an inheritance of thousands of years to rely on regarding the type of personality that a certain zodiac birth sign would inherit and I have no argument with these descriptions. My argument is with the sign itself and the methods of measuring the sun sign of an individual so as to interpret the personality of that person. It may be fair to say that most Western modern astrology is in error. That is not the fault of the astrologers, rather the lack of self-determined information and education. Most modern astrologers use Almanacs or pre-set mathematical software to work out the mathematics involved to give the dates for the day, month and year in which they are carrying out the readings. These systems use mathematical formulas that were originally researched from the Greeks such as Ptolemy, Plato or Hipparchus. The Greek philosophers, having inherited the knowledge from Egypt after Alexander the Great's conquest of that ancient civilisation, measured the stars and the positions of heavenly bodies accurately and with real observations.
" It was a later Egypt that gave birth to horoscope astrology, an Egypt that had made close contact with the ideas of the Babylonians. Pharaonic Egypt had a great interest in astronomy. This is evident in too many ways to mention. But it was the kind of astronomy that involved stars rather than planets. The Egyptians were masters of aligning buildings, temples and especially the pyramids to fixed stars, apparently in an effort to bring about sympathy between terrestrial structures and the stars with which they were associated. Their ability to survey and align buildings with stars was incredibly accurate, often within minutes of arc of the perfect alignment. But they do not seem to have had any planetary theory, nor did they have the proper mathematical techniques. The Mesopotamians inherited the sexagesimal system of numbers from the Sumerians, a system which used place notation in numbers much like our modern decimal system, and which had sexagesimal fractions very similar in kind to our decimal fractions. This enabled the Mesopotamians to do complex computations that would have been difficult in any other ancient system of numerical notation. The other ancient peoples paid Mesopotamian mathematical notation the supreme compliment. They used it whenever they had to do similar calculations of their own. The Egyptians had nothing like it. But they did have a strong sense of a need for terrestrial matters to be brought into synchrony with the heavens. Robert Hand 5. The results of the excellent research of Robert Hand show the error of understanding that has crept into modern astrology over the last two millennia. Theory is not enough in any exercise and all observations must have a practical result to prove the theory. This practical result is missing in modern astrology and lacks the wisdom of our ancestors. To achieve a non-mathematical and practical result, the Egyptians used an inherited instrument that was to be hidden and lost by the Christian movement over the last two thousand years. The blame for this may be the responsibility of Constantine at the beginning of the Byzantine expansion. This was a famous practical instrument that was turned into an icon and became known as the Calvary and Celtic crosses associated with Christ and Christianity 6. Constantine dubbed the cross, suns symbol and it was lost to modern minds as a result. The loss is enormous in terms of understanding the methods and mentality of our ancestors and yet it is evident for all to see on churches and gravestones all around the world. Yet it is more ancient than Christianity and is to be seen in stonework all over the ancient world from Ancient Egypt to pre Columbian South America. Evidence of this device is extant in the Dixon Relics discovered in the north shaft of the Queens Chamber of the Great Pyramid of Khufu in 1872. It is also obvious in the navigational device known as the Celtic cross, which was used by mariners as a precursor of the sextant. through the observation holes to the degrees marked on the rotating wheel. The loss of this instrument to modern western astrologers appears cause the lack of physical observation on their part resulting in the omission of a crucial part of the equation. This omission appears to be a failure to take into account the effects of precessional movement. The Greek or Hellenistic astrologers, however, did take practical sightings and used various instruments such as astrolabes, quadrants and even the famous Antykithera mechanism, which was created in or around 64BC. They are also given credit for the development of mathematics as we know it today and on which our entire scientific development is reliant. However, it appears that the mathematical system used for astrology today has a flaw, which is progressive in its error. The flaw may be the complete lack of inclusion of the phenomena known as the Precession of the Equinoxes. Could Modern Astrology be over 2000 years out of date because of precession. Precession of the equinoxes is caused by a wobble of the earth around the pole every 25,960 years and was it not for this effect, we would have no seasons, and thus life its self as we know it is dependent on the sun and precession. The motion of precession causes the vernal position of the sun to move backward through a zodiac sign at the rate of 1° every 72 years. Since there are 30° in every sign of the Zodiac, it is easy to see a shift of 10° in 720 years. Of course, this shift also affects the position of the sun in any zodiac sign at the same rate. Astrology is ancient, more ancient than most of us realise. There is evidence that our ancestors knew of astrology as far back as 27000 years ago, before the destruction of 90% of the world's flora and fauna at the end of the last ice age 12000 years ago. This is evident from the depiction of Taurus , the Pleaides and the lunar cycles, discovered in the caves of Lascaux in the Dordogne region of France. However, if we go back only 2000 years, there has been a shift of 28° of the position of the sun at the same date of the year. That is almost a whole star sign of 30°. It is highly possible that the Julian calendar that astrologers use, do not take precession into the equation. This is dateable in the case of the present error. An example would be my own birth date of the 25th August 1949. I am, by modern astrologers reckoning, a Virgo, that is to say that I was born on a day when the sun was in Virgo, two days after the sun left Leo. This is the astrological explanation of my sun sign as a Virgo. Virgo is the sixth Sign of the Zodiac, to be exact, and that's the way Virgo's like it: exacting. Those born under this Sign are forever the butts of jokes for being so picky and critical (and they can be), but their 'attention to detail' is for a reason: to help others. Virgo's, more than another Sign, were born to serve, and it gives them great joy. They are also tailor-made for the job, since they are industrious, methodical and efficient. The sense of duty borne by these folks is considerable, and it ensures that they will always work for the greater good. The Virgin represents Virgo in modern Astrology, although this association should not be taken literally. Rather, Virgo's tend to take on some of the qualities of a Virgin, things like modesty and humanity. Some might consider them repressed, although Virgins would argue that it's a noble quality, as opposed to a negative one. Most of all, Virgo's enjoy indulging their practical and logical side and poring over their projects to the nth degree. To say these folks are good at fact-finding almost understates the case, since Virgo's revel in their exacting (some would argue pedantic) behaviour and are a whiz with minutiae. Virgins are assets in the workplace as they can be counted on to get things rights the first time, every time -- and no detail will be overlooked. They are also balanced and fair in their assessments in keeping with the Mutable Quality assigned to this Sign. 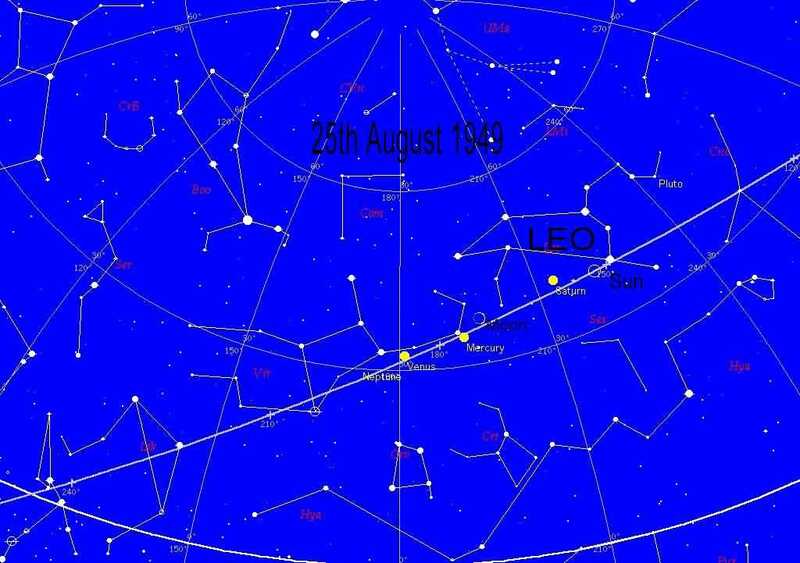 However, by running modern computerised astronomy programs , I see that I was born in the sign of Leo and that the sun was just beside Regulus, the Kings star. The astrologers must be wrong by their own admission outlined earlier. I quote ". It shows the position of the Sun, the Moon, and planets at the precise moment of your birth". It clearly does not show mine to be Virgo on that basis of understanding. The astrology charts appear to be completely out of synchronisation with reality. Those of us who are interested are under the impression that we are affected by a completely different star sign. We also can see that the ascendant sign is also different from the traditional method. What about the attendant planets that are supposed to affect our destiny, are they out too? on your own birth date. This program is free to download from the internet. and not the end of their existing sign. Leo is the fifth Sign of the Zodiac. These folks are impossible to miss, since they love being centre stage. Making an impression is Job One for Leos, and when you consider their personal magnetism, you see the job is quite easy. Leos are an ambitious lot, and their strength of purpose allows them to accomplish a great deal. The fact that these folks are also creative makes their endeavours fun for them and everyone else. It's quite common to see a Leo on stage or in Hollywood, since these folks never shy away from the limelight. They are also supremely talented and have a flair for the dramatic. Warmth and enthusiasm seems to seep from every Leo pore, making these folks a pleasure to be around. They do love pleasure! It's the Lion which symbolises Leos, and the king (or queen) of the jungle is a most appropriate mascot, since these folks consider themselves the rulers of their universe (and the Zodiac at that). Like Lions, Leos tend to be dignified and strong, and it is this sense of their power, which allows them to get things done. A Leo on your team is a good thing, since Lions are eager to see their projects through to completion. Putting these folks at the helm is a good thing, too, since the Leo-born are natural leaders. They may ruffle a few feathers along the way, however, since they can also be overbearing and somewhat autocratic. This may be in keeping with the Fixed Quality assigned to this Sign -- Lions are indeed opinionated and set in their ways. That said, they are well organised, idealistic and have a knack for inspiring others. A vastly different personality profile, I am sure you will agree. Whereas, I do not look to my astrological profile for guidance, I follow my own instincts, I find that the Leo profile suits my personality far better. But what about those who rely on their astrological profile? They will be trying to fit themselves to a personality that is not their own with potentially disastrous psychological consequences. The apparent error represents a difference on an astronomy computer program of approximately 2300 years, and it would seem to me, from this evidence, that the last time Astrology was worked out correctly was in the time of Ptolemaic Egypt or possibly by the Greeks such as Hipparchus. Hipparchus was aware of precession and took it into account in his calculations. He was credited in finding the rate of precession to be 1° every 100 years. It is only in recent history that Sir Isaac Newton discovered precession to be 1° every 72 years. He achieved this calculation at the Giza plateau in Egypt. In between these two calculations is a period of 2000 years in which many changes have occurred, including the rise of Christianity and the forbidding of such practises as magic or astrology. There have been the European Dark Ages when nearly all knowledge was lost and those who practised anything other than the creed were persecuted and often put to death in the most horrible ways in the name of the messenger of love. Let us not forget that it was three wise men that followed a star to Bethlehem, predicting the place of birth of the Christ Child who was the son of man and the Son of God. Astrology was completely extant in the Bible. If such a Messiah were to return today, who would have the skill to predict his coming? What then is the difficulty for modern Astrologers, are they operating on an inefficient calendar? Yes, in my mind, without doubt and the results are total confusion. Astronomy has nothing to do with astrology now and yet it was inseparable in the time of the Mesopotamians, Egyptians and Greeks. Those serious scientists, who operate in astronomy now, consider astrology mumbo jumbo and shun it on almost all occasions, yet if it were not for their work we would not be able to easily discover the error in astrology. It is not surprising since modern astrology is dubbed a pseudoscience, although, for some reason no astronomer has noticed that modern astrology is in error. Has this conflict between the two disciplines driven the average astrologer away from studying practical astronomy, or is it just that they use a different form of non-observed mathematics inherited from a long dead age? If astrologers have seen the vast difference between astronomical observation and astrological calculation, then could they be deliberately concealing the truth to protect their own credibility? To take the kindly route, astrology is difficult to operate on your own without reliance on almanacs etc unless you have a thorough grasp of practical astronomy. If this is the case and astronomers follow a long dead system, then it is a case of the blind following the blind and compounding the error over the years. Without the help of a modern computer program or a working cross with a physical model of the solar system such as a stone circle, the job becomes impossible. A simple example of the difficulty would be that the astrological sign that is on the other side of the sun governs a person's birthday. Because that is so, then it is impossible to see the position of the sun in the zodiac through casual observation, as the sign is obscured by daylight. The only obvious way would be to measure the opposite sign when viewing the southern sky at midnight the evening before, or to take a rough estimate of the position of a sign just before dawn. This is a minor problem to the one posed by constant observation of the planets, they are completely obscured and yet planetary positions are fundamental to astrologers. Is this is why our ancient ancestors built such mighty structures as henges and pyramids?. These structures were functional methods of obtaining on going records of the positions of the zodiac, sun, moon and planets if the operator knows how to use them. 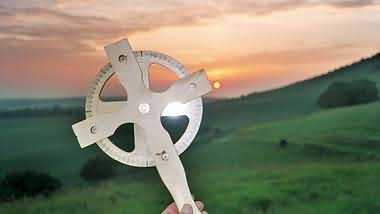 Modern science can only attribute such knowledge as the measuring of solstices and equinoxes by our ancestors and either seem to ignore or dismiss the concept that our forefathers could measure the angles with a degree of accuracy that defies those researchers who investigate these mysteries. The observable error in modern astrology shows that our ancestors were more accurate in astrology than we are today. This is evident when checking your real star sign with a modern astronomical computer program. The sun sign of your birth that the astrologers say you had appears to be wrong. But if you run the program back by two thousand years, they would be right. This, of course is no good to you because you were not born 2000 years ago and the characteristics that they say you have, do not apply to you today. But it does prove that our ancient ancestors took precession into account, even applying it to the astrological ages, modern western astrologers evidently do not. However, there is hope of understanding our ancestors and their methods in the shape of a practical instrument that was used by astrologer/astronomers long before Christianity. The cross and plumbline. With the help of this instrument, astrologers may begin to understand their true inheritance left by our wise ancestors and apply their knowledge with accuracy for the benefit of Mankind. Or we might realise that the answer to our questions comes from within our selves and not from outside sources or other so-called authorities. The Golden Thread of Time by Crichton E M Miller ISBN 0-9541639-0-7. 6 Crichton E M Miller, The Golden Thread of Time. Pendulum Publishing. 7 Crichton E M Miller, The Golden Thread of Time. Pendulum Publishing. ISBN 0954163907 2002 Pages 105-122. 9 Crichton E M Miller, The Golden Thread of Time. Pendulum Publishing. ISBN 0954163907 2002 Pages 151-153. 13 Crichton E M Miller, The Golden Thread of Time. Pendulum Publishing. ISBN 0954163907 2002 Pages 140-150.